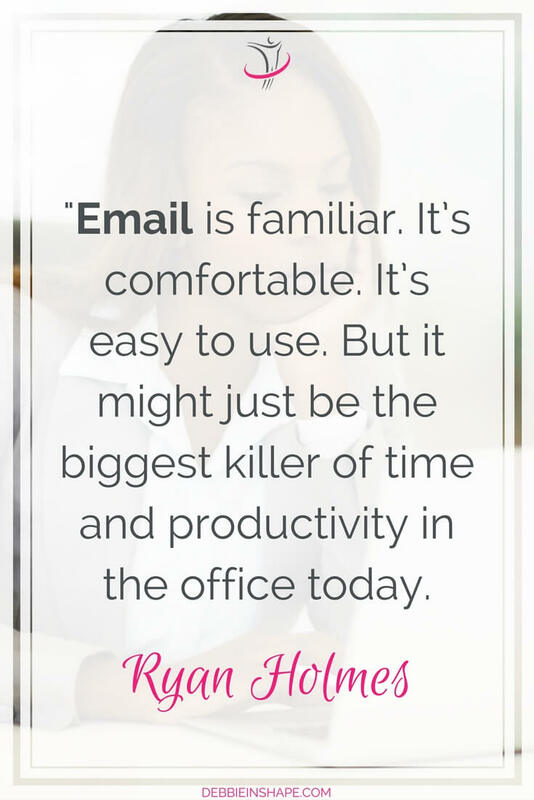 If you struggle with your inbox, you must first stop hating yourself for bad email productivity. Learn how I’m doing it one day at a time. 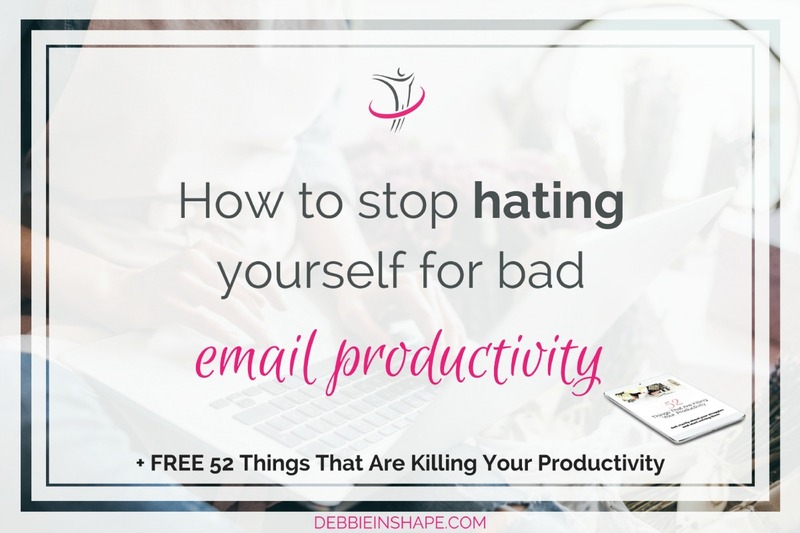 Why am I telling you to stop hating yourself for bad email productivity? Because I’ve done it for long enough to know exactly how it goes. Every time I saw my boyfriend’s inbox, I felt miserable. Because of an inbox, Debbie? It was more than just than his emailing skills, but the feeling of me, being so good in organizing planning a lot of things, failing terribly in that area. Remember when we talked about perfectionism? Unless you break up with it, you feel stuck, lost, and end up procrastinating. Did I improve the past months? Absolutely! But before we move on, let me clarify one thing: my email productivity skills can be better. I’m NOT an over-20,000-unread-emails person anymore, but I’m still to reach inbox zero. One thing I’ve learned is that I could hate myself as much as I wanted, but the number of emails I had wouldn’t go any lower because of that. On the contrary, since I wasn’t taking any action, it only got worse. It took a lot longer than it should, but I finally realized I had to approach the situation with the same level of practicality I used for everything else in my life. Since it was easy to measure the damage, I jumped towards the second step of Mindful Planning: Analyze. Had too many email accounts. Was using my inboxes as reminders. Was using my inboxes as archives. Didn’t apply the 2-minute rule for new messages. Wasn’t making any time to clean things up. As you can see, these aren’t things that happen overnight. And the best way to solve them is by setting negative feelings aside and getting to work. One of my many email accounts is almost 20 years old. It had so much junk in it that while it may sound strange, it was the easiest one to get organized. I had the habit of creating separate accounts to separate contacts. Even though some of them were deactivated throughout the years, I still had more than I needed. And all of them were chaotic! Whenever I received a message related to something I had to do in the future, I kept it in my inbox. If I wanted to take time to reply to a friend, I did the same. Needless to say, it wasn’t an efficient method at all. Things were so cluttered there was no way I could remember everything that was there. Not only I kept emails related to things I didn’t want to forget. I also stored messages I wanted to save for later. I did pretty much the same thing as what I used to do with my letters. That was, in fact, the main reason why I could never just delete stuff without reviewing it. It wasn’t only clutter I had there. On his book Get Things Done, David Allen explains the 2-minute rule. Putting it simply: if you can do it in 2 minutes or less, just do it right away. No delay or procrastination. It’s straightforward and easy to apply, isn’t it? Now, I’d say “of course”, but it wasn’t my approach at all. So my inboxes were cluttered and messy. Time for action, right? Well, that wasn’t what I did. Instead, I just hated myself. No productive effort at all. Only lack of motivation and blame. I was wasting time with negativity when I should be using my emotions to become more efficient. This mindset and approach to my inboxes went on for years. Last year, however, I decided that it was time to change it. I started reading blogs, books, and following gurus on the subject. While I learned something new each time, I couldn’t find an approach that matched my needs. For example, archiving or deleting everything weren’t options I was comfortable with at all. Early this year, I made it a priority and assumed the responsibility of putting together a strategy that worked for me. The result was a 10-step checklist you can download FOR FREE here. Add all your email accounts to one tool. 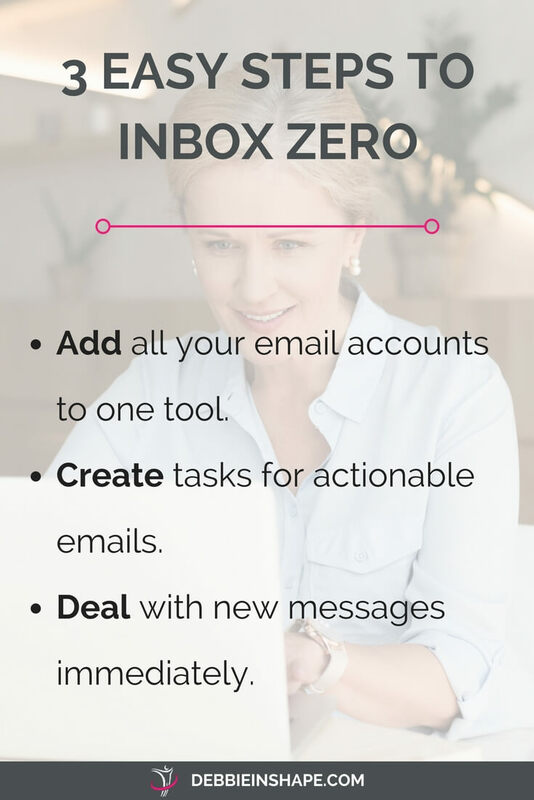 Create tasks for actionable emails. Deal with new messages immediately. It is possible to reach inbox zero, or get as close to as you want. 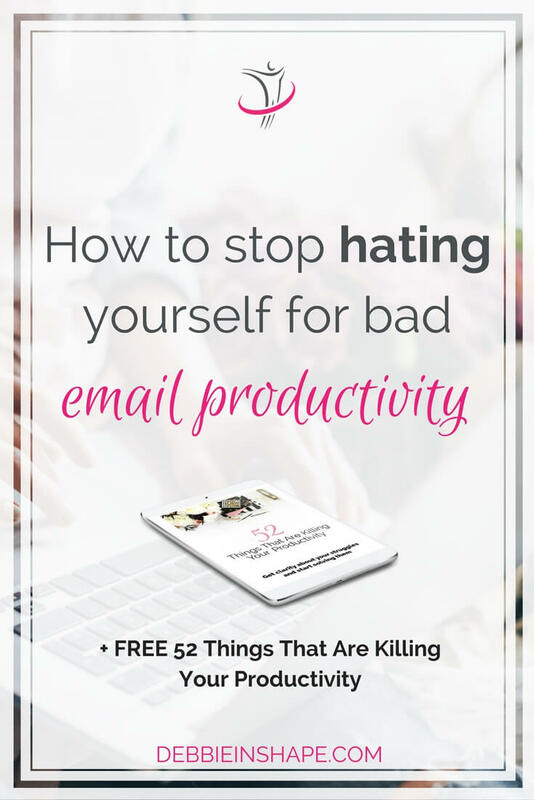 The first step you must take is to stop hating yourself for bad email productivity. It isn’t who you are, and you shouldn’t make it personal. Grab my Inbox Zero For Perfectionists checklist today and get started. To make sure you stay on track and get the results you want, join my community of like-minded achievers for accountability and support. I’m hosting a 52-week productivity challenge on my closed Facebook Group. You can read everything about the challenge here. 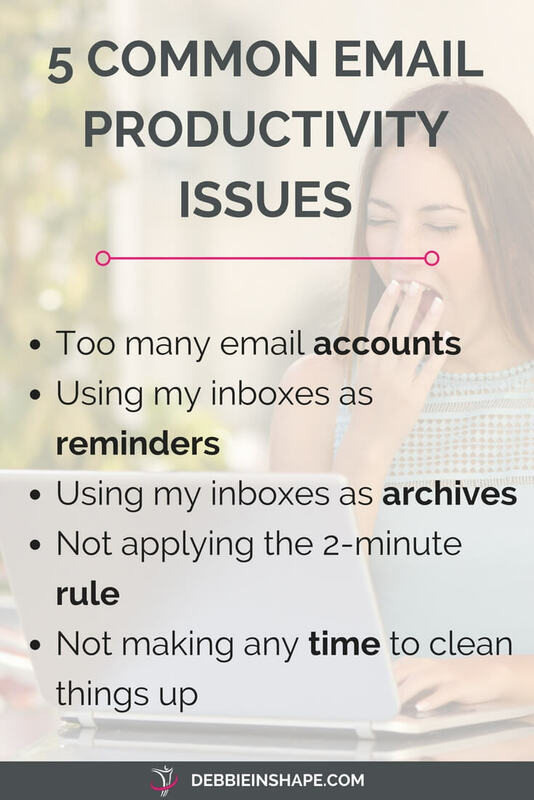 First of all, grab a copy of the list 52 Things That Are Killing Your Productivity . After signing up, you’ll be invited to join my closed Facebook group. On the group, I’ll share daily prompts during the 52-Week Challenge For A More Productive You. I’ll guide you through a brand-new topic each week. You can start the 52-Week Challenge For A More Productive You at any moment of the year. And you choose whether to follow every single week or to focus on your personal pain points. If you miss anything, you can always refer to older posts for catch-up or review. The method I apply to the challenge is exactly the same one I use with my clients: Mindful Planning™. It’s a 5-step method you can use to all aspects of your life become more productive one day at a time without added stress. Come and join the 52-Week Challenge For A More Productive You today. I’m looking forward guiding you towards a successful year and beyond! CREATE SPACE FOR THE THINGS YOU LOVE! Join my free VIP Tribe for exclusive tips and content. Welcome to the Plan With Debbie tribe! Debbie Rodrigues is a Productivity Life Coach. She helps overwhelmed active women define realistic priorities to overcome procrastination and develop a fulfilling lifestyle. She does this through coaching, online courses and through the blog debbieinshape.com. Get clarity about not-so-obvious time-wasters that are holding you back so that you can solve them.